Composer, conductor and violonist, who studied with the most acclaimed musicians in Italy and in the world (R. Mirigliano and R. Pezzati in Florence; C. Togni in Fiesole, E. Morricone in Siena, P. Dusapin. in Rome, R. Alessandrini, R. Clemencic, O. Dantone, R. Gabbiani, D. Fasolis, G. Graden, C. Hogset, P. Neumann in Arezzo). He gave concerts performing with Insieme Vocale Vox Cordis, Hesperimenta Vocal Ensemble di Arezzo and UT insieme vocale-consonante winning several national and international awards (Arezzo, Cantonigros, Gorizia, Lugano, Montreux, Senlis, Varna, Vittorio Veneto). He won the 28 edition of European Grand Prix for Choral Singing with UT Insieme Vocale Consonante (14, may 2016). In 2007 he won two first prizes at the Concorso Internazionale per Direttori di Coro "Mariele Ventre" di Bologna. 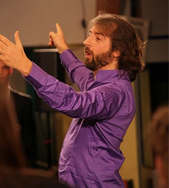 From 2010 to 2014 he conducted the Italian Youth Choir. His compositions are performed by ensembles as well as soloists around the world and have been published by many Italian publishing houses. His choral works were asked and/or performed by the Choir of the Accademia di Santa Cecilia, Coro del Maggio Musicale Fiorentino, Coro Giovanile Italiano, Grex Vocalis (Oslo), Joyfull Company of Londen, Philippines Madrigal Singers, St. Jakobs Chamber Choir from Stockholm. He won notable awards in international competitions such as Arezzo (1996 e 1999), Gorizia (1999 e 2002), Rome (1999), Avellino (2003), Vittorio Veneto (2007). He publishes with Pizzicato Verlag, Carus Verlag and others. He collaborates with several national cultural institutes like the Centro Studi Musicali F. Busoni di Empoli, FENIARCO, Festival Incontro Polifonico Città di Fano, Fondazione Guido d'Arezzo. He holds courses on choral music and composition in Italy and abroad (China, France, Russia) and for important conducting schools. He is often invited to join the jury at international competitions. He teaches choral conducting at the Conservatory of Trento. Zoltán Sándor graduated first as piano teacher in Miskolc, then as conductor at the Musical Academy Budapest, took part – among others – in the master class of Eric Ericson. He received his postgraduate degree (DLA) in 2004. Presently he teaches at the Musical Faculty of the University of Miskolc. Besides “Bartók Choir of Miskolc” he also conducts a female choir of the musical faculty, the Teacher's Choir of Szerencs and the Hassler Vocal Ensemble. His choirs have been awarded many prizes at significant choral competitions not only in Hungary, but abroad, among others in Italy, Germany, Slovakia, Spain and Switzerland. Moreover, he regularly takes part in the juries of international music competitions.